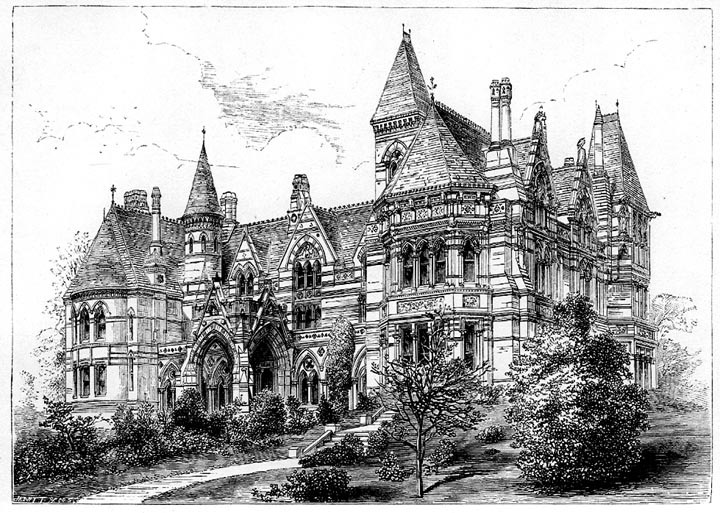 Eatington (now Ettington) Park (1858), designed by J. Prichard for the E. P Shirley, Esq. Marked lower left "Jewitt & Co." Drawing from Eastlake, facing p. 307. Only twelve months after Quar Wood was begun, Mr. J. Prichard of Llandaff, whose ability had secured to him more than provincial repute was called on to remodel the country residence of Mr. John Shirley at Eatington Park in Warwickshire. This is at all times a difficult task, especially when the building to be altered has either no architectural character of its own, or possesses one at variance with the style which it is expected to assume. Mr. Prichard, however, after making sundry alterations of a substantial kind, proceeded to clothe the whole structure with what Mr. Ruskin would call a new 'wall-veil.' And perhaps it is not too much to say that it is a wall-veil which Mr. Ruskin would have approved. The use of natural colour in construction was one of the points which had been frequently advocated in 'The Seven Lamps' and in 'The Stones of Venice' where also may be found many a plea for the introduction of decorative sculpture and many an Igument to prove the superiority of what is there called surface pthic over linear Gothic. Whether Mr. Prichard was influenced by its advice, or whether his own course of professional study had led him to the same conclusions, is a matter of little moment; but no one has examined the work at Ettington can doubt that it embodies in its design much of those principles which were at one time identified with Mr. Ruskin's name. The general plan of the house was, from the condition of things, English in arrangement, but the horizontal bands of colour in the masonry, the character of the arcading and upper windows, and, above all, the square campanile which rises from an internal angle in the building, are all Italian in character. The same may be said of the cornices, parapets, and enriched string-courses, while the carving of the capitals and some other details suggest a French origin. Decorative sculpture is largely employed in panels above the ground-floor win- dows, and the tympana of arches over those on the main floor are simi- larly enriched, and this not merely after the rude conventional way in which such work is usually executed, but with figure subjects most artistically de- signed, and executed with consummate skill. The main entrance to the house is under a groined porch, which is perhaps the least satisfactory part of the design, owing to the semi-ecclesiastical appear- ance which it assumes, and the somewhat restless character of the details. But there are features in the building which, for merits of general form, judicious ornament, and refined workmanship are worthy of the highest praise, especially when it is remembered that the adapta- tion of the style to such a purpose was at the time almost a complete novelty in this country. The whole work exhibits evidence of close and attentive study. Even the chimneys are invested with a picturesque character which is all their own, and none the less admirable for its originality.